Mrs. Rose Marie Bentley lived a long life until dying of natural causes at the age of 99. She had five children, three girls, and two boys. “She volunteered during World War II for one of the nurse’s aid corps.” Said Patti Helmig, the oldest of Mrs. Bentley’s daughters. Mrs. Bentley was always fascinated by science, she loved it when someone reached out to her about her research on smallpox survivors, as she was one herself as a child. 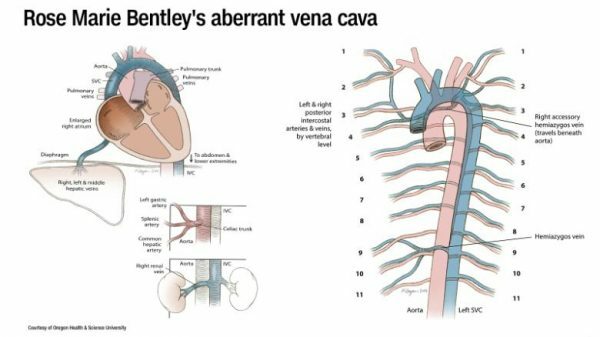 Mrs. Bentley had chronic heartburn, her gallbladder and appendix removed and hysterectomy, though the doctors didn’t realize, or did nothing about, her inverted organs. Mrs. Bentley was always very healthy, “She was always doing something, taking us to Campfire Girls, fishing, swimming. She was an excellent swimmer.” Said Ginger Robbins, then the third child of Mrs. Bentley. Mrs. Bentley wanted to donate her body to science, when she died. So, on October 12th, 2017, the day she died, her body made the journey that would lander her at Oregon Health and Science University in Portland. Students were given bodies, five students for each body. The cadaver given in spring 2018 to 26-year-old medical student Warren Nielsen and four of his classmates was Mrs. Bentley, though they didn’t know at the time, for the privacy of the person. The goal was to examine the heart. The professors began to question their knowledge after they began on Mrs. Bentley. Her heart was missing the large vein, the inferior vena cava, which is normally on the right side of the heart. Bewildered, the team called over the professors. “They kind of rolled their eyes, like ‘How can these students miss this big vessel?’ They came over and that’s when the hubbub starts. They’re like, ‘Oh, my God, this is totally backwards!’” one of the students told CNN. They continued in deeper to her body and found that she had all of her organs inverted. “Like looking into a mirror of your organs,” as one of the professors at Organ Health and Science University put it. Despite her chronic heartburn, Mrs. Bentley never showed any negative effects from her inverted organs. Jim Bentley, Mrs. Bentley’s husband, donated his body to science as well. The couple had planned on donating their bodies for a while, their decision has now affected their kids. All of their girls have decided to donate their bodies as well. Who knows, maybe Mrs. Bentley’s children may be another of the one in fifty million medical unicorns.